Although the overall tablet market has been in decline recently, Windows slates are finding an ally in the enterprise. According to the Mobility Index Report published by Good Technology, Windows tablet adoption increased 400%, from 1% in the last quarter of 2014 to 4% in the first quarter this year. Despite gains, Windows slates still trail iOS and Android tablet activations in enterprise. Even though Apple's iPad maintained a healthy lead of 81% market share, iOS activations decreased 4% compared to the fourth quarter of last year and are down from 92% a year ago. Android tablets made a gain of 1% from the prior quarter with 15% market share by activations. Windows is making inroads in a few verticals. "Windows tablets made up 5% of all activations in retail, while Windows Phone devices made up 7% of all activations in entertainment and media," according to the report. "This is the first time that any Microsoft operating system has exceeded 5% in any vertical in the report." Not accounting for specific verticals, by operating system, Windows Phone only accounted for 1% of total device activations, trailing the 72% activation for iOS and 26% activation for Android. Windows also registered 1% of total activations, with Good noting that "most of these devices were tablets running Windows Pro." An earlier IDC report revealed that even though the overall tablet market may be shrinking, the market for more productive tablets, like hybrids and convertibles that offer a keyboard experience, is growing. Although a few of the hybrids ship with Android, many of these convertibles - like the Surface 3 and Lenovo ThinkPad Yoga 12 - come with Windows and offer access to legacy Win32 desktop apps. The growth of Windows on mobile devices in the enterprise is unsurprising given the need for business apps. According to Good, the top five app categories demanded by businesses include secure browser, secure IM, document access, document editing and custom apps. 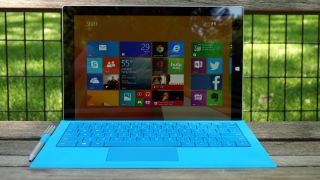 With Windows slates running Windows 8.1 Pro, users have access to all of those features, Microsoft Office and legacy Win32 apps that may not have a mobile equivalent. Windows 10 may fuel additional growth in the Windows tablet market this summer. Microsoft will add new features that make tablet computing better with Windows 10. The new Continuum mode in Windows 10 allows users to seamless switch between desktop and tablet interfaces seamlessly, providing a great experience in laptop or slate computing modes. Universal Windows apps mean that a user can buy an app once and run it on a phone, tablet, laptop, desktop and even Xbox One. Microsoft is expected to ship the operating system in July.